This couple had the purr-fect idea for their wedding — a kitten hour! Forget cocktail hour, it's time for kittens! 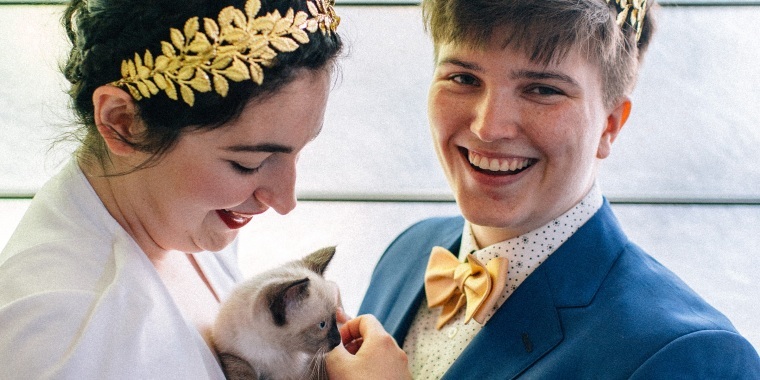 A Seattle couple had the perfect — or should we say purr-fect — wedding. Colleen and Iz, who withheld their last name for privacy reasons, invited six furry felines to their wedding on Aug. 4. You've heard of a cocktail hour — well, this was an hour with cats. "We are huge cat people," Colleen told TODAY. "We make our cat food from scratch by hand." The couple's two cats, 7-year-olds Ladybird and Pangur Ban, couldn't make it for the big day; Ladybird is blind and Pangur Ban has irritable bowel syndrome. "Our cats are very, very special to us and we wanted to bring some of their spirit and honor and love that they have brought into our lives to the wedding," Colleen said. The couple compromised by using a figurine of the two cats as their cake topper at the wedding. So, for a donation to the Seattle Animal Shelter, the couple and their wedding guests received an hour with a litter of six kittens. Guests were also able to give donations to the shelter. The 6-week-old felines were well taken care of at the wedding, with plenty of food, water and shade — and adoring people! "It was a great bonding opportunity," Iz said. "I think all of our guests were cat people." The cats, which Colleen said were described as "unusually mellow," helped guests relax at the wedding. "A wedding is a stressful event," Colleen said. "I think everybody feels a little tense, a little excited, a little nervous. To come to our wedding and to be handed a kitten, I think it sets the tone that our wedding was about not taking ourselves too seriously, about community — and about baby cats." Despite being very allergic to cats, Colleen didn't let that get in the way of snuggling the kittens. "They smelled like clean laundry," Colleen said. "I doubled up on the Flonase for the wedding and powered through for my love of cats." Though the wedding was held a few months ago, pics from the kitten hour have been making the rounds this week. Besides Ladybird and Pangur Ban, cats have a special significance for the couple. "On one of our very first dates, we were walking around in Oakland and Iz spotted a cat on a porch and coaxed it on down," Colleen said. "I thought, 'If there is someone so sweet and so tender that any cat wants to play with this person, that is the kind of girl I need to marry.'" Colleen and Iz hope to volunteer with the Seattle Animal Shelter in the future to help create similar kitten appearances for others. "We had such a great experience with them that we also want to help other people have the same experience at their weddings," Colleen said. Although the idea may seem unconventional, it may actually be just right for weddings. "You don’t get to throw big parties like this all the time," Iz said. "When else are you going to have kittens show up to your party?"